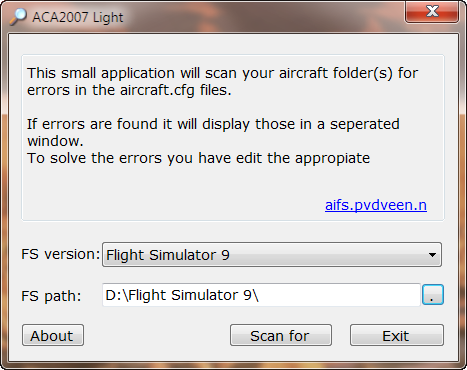 ACA2007 Light is only a simple and fast error scanner for your aircraft.cfg files like the error scanner that is present in the MRAI Setup wizard. At first startup the scanner tries to find your FS2004 and FSX installations. If not found you can enter the location by yourself. For FS2004 it will scan the aircraft folder. 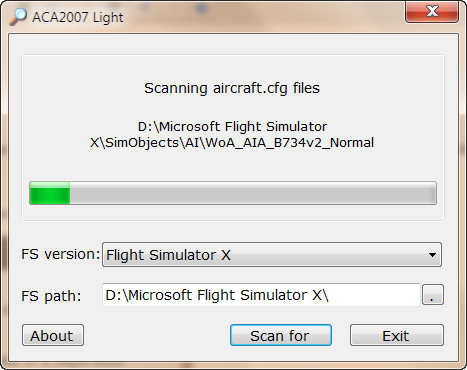 For FSX it will scan all SimObjectPaths entries in your FSX.cfg files. Select the SFS version you want to scan and start the scan by clicking on the ‘Scan for Error’ button. It will go through all the aircraft.cfg files in the directories pointed above. If errors are found they will be displayed in a text box. You can eventually save this to a file. Errors in the numbers of the fltsim section. 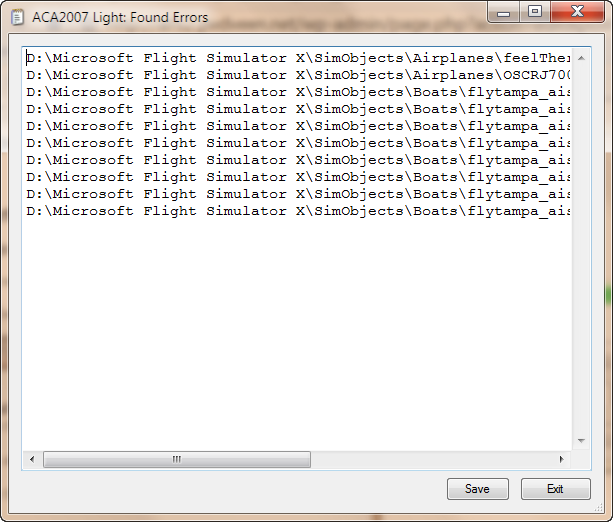 If you want more errors scans or want to edit the aircraft.cfg file directly you can use the free pro version ACA2005. See its documentation for more details. ACA2007 Light, and this document are copyright © 2006 Peter van der Veen. ACA2007 Light and this document are freeware and may not be distributed for commercial purposes or posted in the public domain without the author’s consent. ACA2007 Light may not be distributed for commercial purposes ON CD OR ANY MEDIUM FOR ANY KIND OF FEE, INCLUDING THE COST OF PRODUCTION, MATERIALS OR POSTAGE or posted in the public domain without the author’s consent.